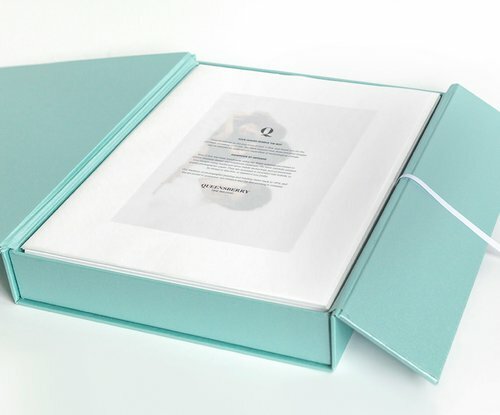 Our Queensberry Premium Boxes are made with a beautiful split-lid design, making them the perfect finishing touch for up to 25 matted prints. Each Premium Box is fastened with a hidden magnetic catch, and has a narrow white ribbed ribbon to help lift the prints out easily. Premium Boxes are available in two sizes 14" x 11" and 10" x 8"
Available in four depths (10, 15, 20 or 25) matted Lustre prints. The quality of printing is stunning. You can upgrade to have your prints printed on either Metallic, Fine Art or Fine Art Museum Quality paper for additional cost.